Save $0.90 on Kellogg's Eggo waffles 280 g- 560 g.
Save $1 on Kellogg's Vector Granola product. 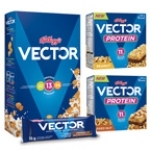 Save $1 on Kellogg's Vector Protein Bites. 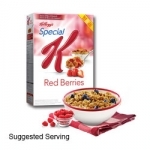 Get a Free box Kellogg's Special K protein cereal. Save $2.50 on Kellogg's Vector meal replacement cereal. Get a coupon for Free Kellogg's Special K Nourish cereal. Get a Free Box of Kellogg's Special K Protein (400g) cereal. Get Free Kellogg's All-Bran Cranberry Almond Granola 300 g.
Save $1.50 on Kellogg's Special K Nourish cereal. Save $1 when you purchase a bag of Vector Honey Almond Granola (317 g). Save $1 on Kellogg's Mini-Wheats Harvest Blueberry & Red Wheat (405 g). Save $2 on any Breyers product when you purchase Eggo waffle 244 g - 330 g.
Save $2 when you buy any (2) two Vector Meal Replacement 400g and/or Vector Granola 317g. Save $2 when you buy 2 Vector Granola 317g packs. Various coupons for Buy 1 Get 1 Free Kellogg's cereals. Copyright © 2012 Smart Canucks, Inc.